We’re diving into the final installment of our spring shoe madness today with Bird of Flight, and I couldn’t be more excited about this one! If you missed Parts One or Two of this three-part series, make sure you hit those links to check them out and experience the full spring shoe-stravaganza that’s been happening over the last couple of weeks. I’ve been so excited for you guys to see what shoe style and fun spring getup we have in store for Part Three of the series because I feel like these sock bootie beauties are the absolute perfect way to finish this thing with a bang! And I really hope that you’ve enjoyed this foray into the world of one of my favorite shoe brands, Bird of Flight, and that it’s inspired all my likeminded, casual-cool ladies out there who think comfort, quality and style are equally important to live your best spring shoe lives, sans compromise! I’ll admit that when sock booties popped up in recent years and became a bonafide shoe trend, I was skeptical. Though that’s not necessarily anything new. I can be a little wary of trends because for the most part. I know what I like and not every trend fits into my style comfort zone. But when it came to sock booties, I was curious because I’d seen them look pretty rad on many a style maven, but was generally unsure if I could pull them off and questions abounded. Would they be flattering on me? Could I find a way to fit them into my own personal brand of casual style? Was I even cool enough to attempt such a footwear statement? 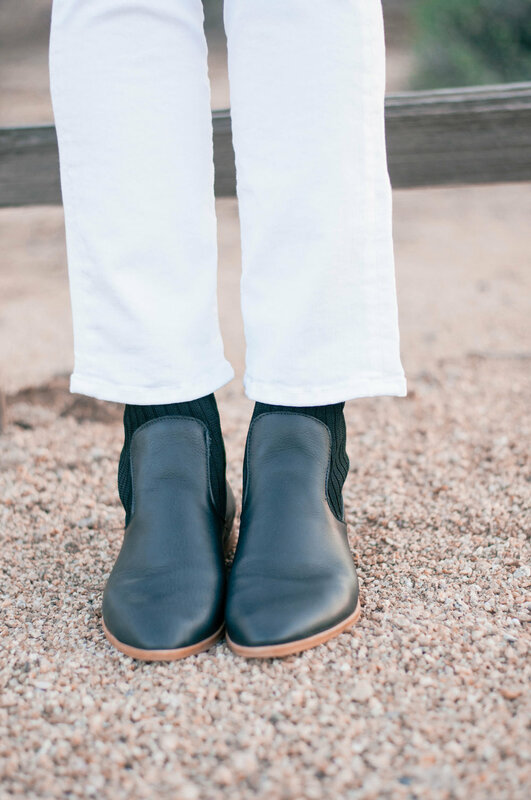 But leave it to Naomi, founder and designer of Bird of Flight, to ease all of my sock bootie fears and find a way to make the most gorgeous, classic, flattering, casual-cool yet perfectly polished leather sock booties that I never knew I always needed. First, I tried these stunning navy leather booties with a navy tweed a-line mini, navy tights and a striped bateau tee for a polished, but effortless look that made me feel so French girl-chic without feeling fussy. The sock part of the sock booties melted right into the tights and actually elongated my legs instead of doing what I’d so irrationally feared they might do - make them look stumpier. And then as spring approached I thought that I needed to try an entirely different approach to see if these sock booties were as versatile as I’d hoped, with a totally different look in a completely different season, so I contrasted the navy in the booties with some crisp, spring-ready, high-waisted white jeans with an ankle hem and paired those with a lightweight, floral-print navy top, and I’m just as in love with this look as I was with my French girl getup! 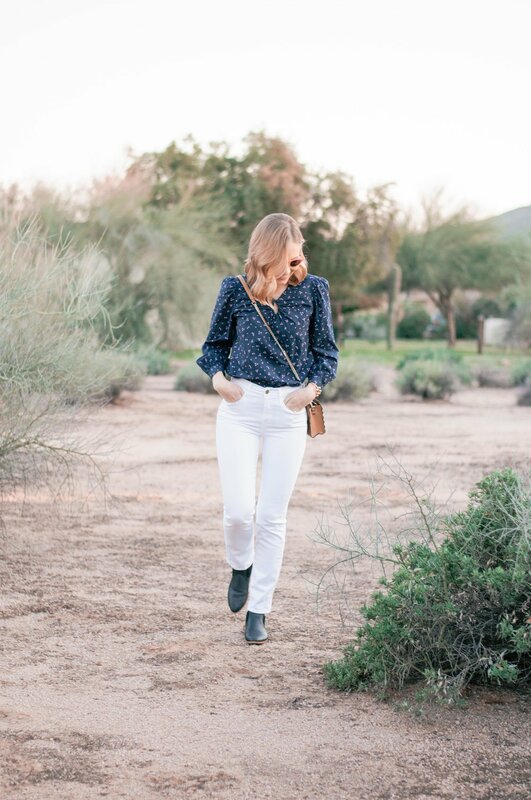 These jeans have a slight kick hem, meaning they have an ever-so-slight flare at the hem, which I think is the perfect pant style, along with a full wide-leg cropped pant, if you’re going to do sock bootie with pants. 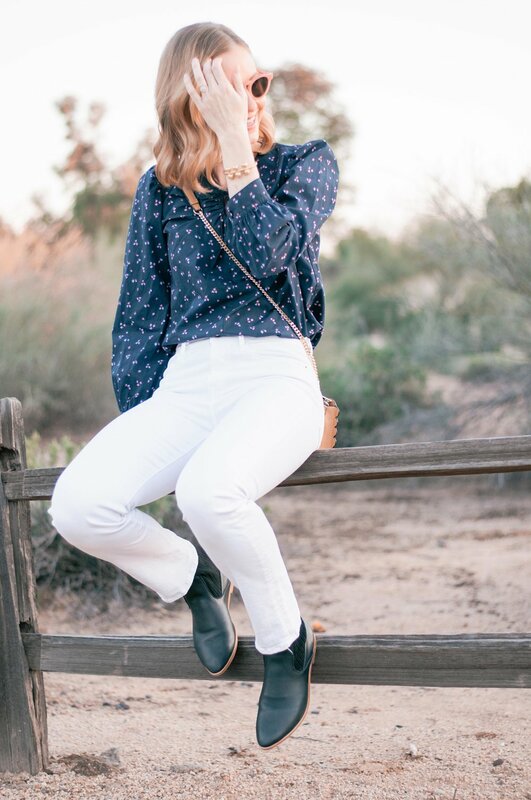 I think you need a pant that pulls away from the sock portion of the boot and your ankle and shows it off a little bit, instead of say, a traditional skinny jean that sticks right to it and hides it. 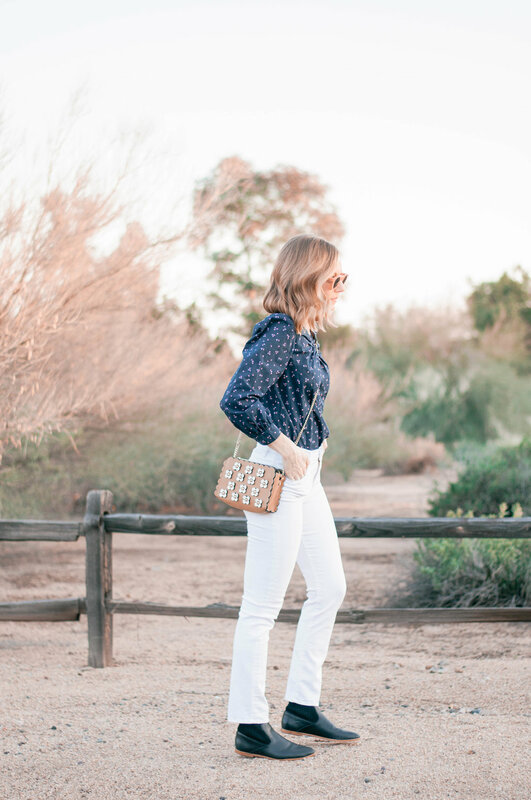 I’m not saying you have to go full crop and get tangled up in all sorts of crazy proportions, but I think that some sort of ankle length hem with a bit flare, a straight cut or a full wide leg is just the ticket! Can we also just take a minute to appreciate the utter gorgeousness of this navy leather, and the use of navy here in general? I wish you guys could feel this leather in person because it so, so soft and smooth. Buttah! I also love the slight point in the toe, which I think makes this shoe even more flattering and au currant. It’s all just so classic, which is why it’s one of those shoe styles you’d keep around for years and years and style about a thousand ways. Again, leave it to Naomi to create a sock bootie that takes the look from trend to timeless with a million perfect details for casual-cool, trend-shy girls to love. Like I mentioned last week, you can find new Bird of Flight shoe styles dropping at Anthropologie, Free People, Clad & Cloth and in stores across the country all the time, but you have to be quick! Every style sells out in a flash, so my advice is that if you see something you love, grab it before it’s gone! The good news? Tons of seriously gorgeous new spring styles are making their way to all of those sites and stores right now. 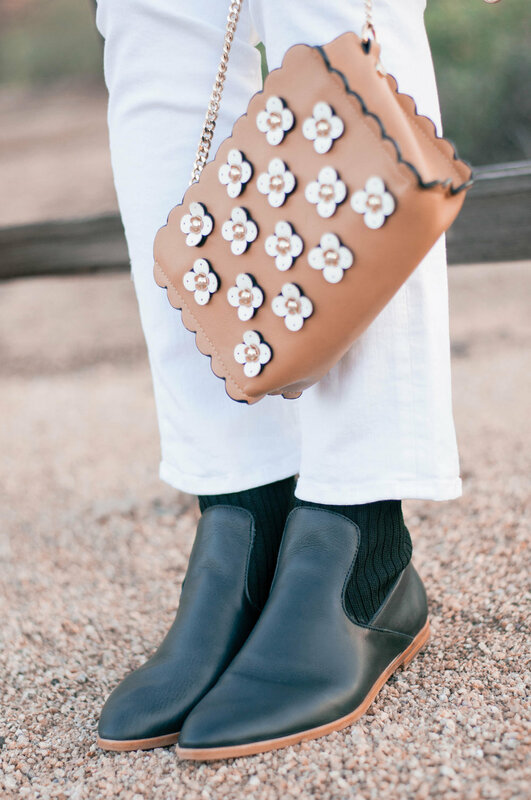 You can shop the Lola flat, which I’m personally obsessed with and need in my life ASAP, the similar Lacey flats that are perfect for casual spring and summer livin’, the adorable perforated Happy bootie, and a bootie that I feel like I’ve been waiting my whole boot-loving life to live in, the Gameboy bootie! I love the low profile on the Gameboy bootie - perfect for pairing with pants or fun spring skirts! Or you can take peak at all of the goodness that Naomi has in store for Bird of Flight this spring by checking out their spring ‘19 lookbook on the Bird of Flight site. So what do you think? Do these make you feel like you could do sock booties, too? After wearing these puppies, consider me lovestruck! And like I said I hope this little spring shoe series with a brand I absolutely love and can’t wait to see and wear more of, Bird of Flight, has inspired all of my fellow lovers of casual, unfussy, timeless style to live out all your shoe dreams this spring and never compromise when it comes to your footwear! And a very, very special thanks to Naomi for letting me prance around the desert in her gorgeous creations and for designing shoes that effortlessly blend form and function in the most beautiful way.